American rabbi and author; born in Ostrowo, Prussia, Jan. 21, 1858. He emigrated to America (New York) in July, 1872, and from New York he went to Fall River, Mass., where he found employment as clerk in a tea-store. Through the influence of friends Krauskopf secured admittance into the Hebrew Union College, Cincinnati (Oct., 1875). 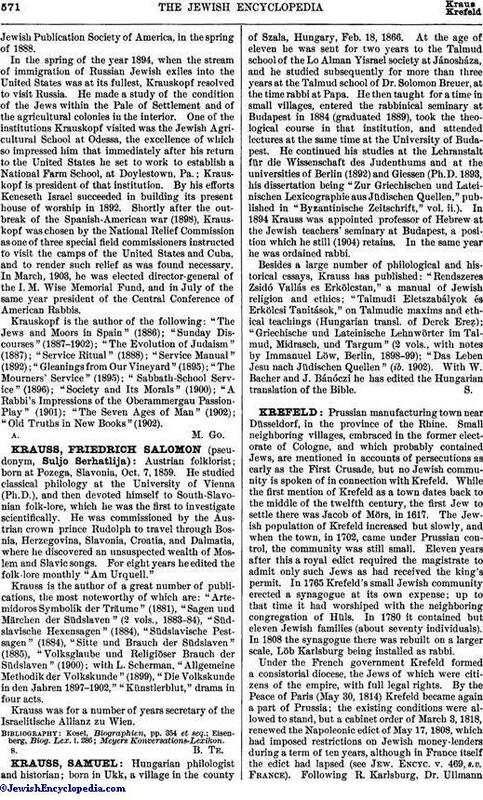 While studying there and in the University of Cincinnati, Krauskopf acted as a tutor, contributed articles to journals, and published (with H. Berkowitz) "The First Union Hebrew Reader" and "Second Union Hebrew Reader" and "Bible Ethics" (1883). He graduated from the university and from the Hebrew Union College (rabbi) in 1883. In 1885 the faculty of the college conferred upon him the degree of D.D. Krauskopf received and accepted a call from the Bnai Jehudah congregation in Kansas City, Mo. He was appointed by the governor of Missouri as a life-member of the Board of National Charities and Corrections, and in 1885 was elected vice-president of the Pittsburg Conference, of which Dr. I. M. Wise was president. In the same year Krauskopf received a call from the Keneseth Israel congregation (Reform) of Philadelphia. Krauskopf entered on his duties in Philadelphia, Oct. 19, 1887. He established a Sunday service in addition to the regular Sabbath service; under his ministration the congregation flourished, and has become one of the largest Jewish congregations in the United States. Seventeen volumes of Krauskopf's lectures, embracing subjects in the fields of religion, ethics, and social science, have been published since 1888. He aided in the organization of theJewish Publication Society of America, in the spring of 1888. In the spring of the year 1894, when the stream of immigration of Russian Jewish exiles into the United States was at its fullest, Krauskopf resolved to visit Russia. He made a study of the condition of the Jews within the Pale of Settlement and of the agricultural colonies in the interior. One of the institutions Krauskopf visited was the Jewish Agricultural School at Odessa, the excellence of which so impressed him that immediately after his return to the United States he set to work to establish a National Farm School, at Doylestown, Pa.; Krauskopf is president of that institution. By his efforts Keneseth Israel succeeded in building its present house of worship in 1892. Shortly after the outbreak of the Spanish-American war (1898), Krauskopf was chosen by the National Relief Commission as one of three special field commissioners instructed to visit the camps of the United States and Cuba, and to render such relief as was found necessary. In March, 1903, he was elected director-general of the I. M. Wise Memorial Fund, and in July of the same year president of the Central Conference of American Rabbis. 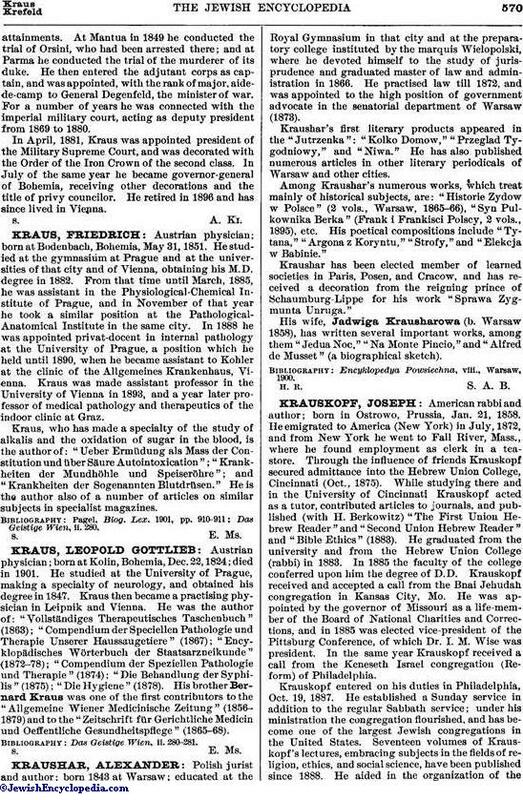 Krauskopf is the author of the following: "The Jews and Moors in Spain" (1886); "Sunday Discourses" (1887-1902); "The Evolution of Judaism" (1887); "Service Ritual" (1888); "Service Manual" (1892); "Gleanings from Our Vineyard" (1895); "The Mourners' Service" (1895); "Sabbath-School Service" (1896); "Society and Its Morals" (1900); "A Rabbi's Impressions of the Oberammergau Passion-Play" (1901); "The Seven Ages of Man" (1902); "Old Truths in New Books" (1902).